Figure 6.13: DA segmentation of MS lesions from Fig. 6.11(b). Segmentation of the extracted features allows us to investigate the effect of occlusion induced by these features in generating stereo disparity mapping and 3-D visualization of the optic cup/disk, leading to more accurate diagnosis or monitoring of glaucoma. This is a challenging task due to poor and nonuniform illumination of most fundus images and lack of standardized parameters for stereo imaging geometry. Figure 6.14: DA segmentation of MS lesions from Fig. 6.11(c). imaging system. However, fully automated methods of finding precise disparities between a pair of stereoscopic images may still be problematic due to the presence of noise, occlusions, distortions, and lack of knowledge of the stereo imaging parameters. Under certain constraints, 3-D surface recovery of the optic cup/disk is possible from a pyramidal surface-matching algorithm based on the recovery of the optimum surface within a 3-D cross-correlation coefficient volume via a two-stage dynamic programming technique. The accuracy of the disparity map algorithm leading to 3-D surface recovery is highly dependent on the initial feature extraction process and the stereo imaging parameters. Figure 6.15: DA segmentation of MS lesions from Fig. 6.11(d). assuming a nonconvergent imaging system. However, the geometrical information of the viewing angles when fundus images are taken in a clinical set-up are not documented, thus introducing certain ambiguities in the disparity mapping of the corresponding points in the stereo pairs. The overall process for 3-D visualization of retinal structures from stereo image pairs is complex and includes different matching strategies, area or feature based or a combination of both. Several preprocessing steps are also followed for feature extraction and registration prior to coarse to fine disparity search. where f and g are the windows of pixels to be measured and f and g are corresponding average values. K and L define the size of those windows, and the indices for the pixels within the windows are i and j. a (f) and a (g) are the square roots of the covariances cov( f, f) and cov(g, g), respectively. According to the inherent Fourier spectrum properties, a rotation in the spatial image results in the same amount of rotation of its spectrum. Thus it is possible to find the angle of rotation of one image in the stereo pair with respect to the other by performing step-by-step rotations and cross correlating their Fourier transforms. The actual angle of rotation will be the one with the highest cross-correlation obtained. Rotational compensation is applied once the angle of rotation has been found. where S(x, y) is the Kronecker delta and A, B, and C are the first three coefficients for this power cepstrum expansion series . Equation (6.22) shows that the displacement between images results in the sum of the power cepstrum of the original image w(x, y) plus a multitude of delta functions. Each delta is separated from the others by an integer multiple of the actual displacement we are looking for. In order to enhance the cepstral peaks, the cepstrum of the reference must be subtracted from the cepstrum of the stereo pair. With this in mind, a fixed number of deltas are chosen from the resulting cepstrum. Each delta represents a translational shift, or an integer multiple of the shift, of a pixel in the image shifted from the corresponding pixel in the reference image. All points are tested by cross correlating the reference image with the other image shifted by the number of pixels (in the vertical and horizontal directions) indicated by the current point being tested. 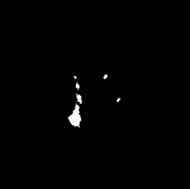 The highest correlation will correspond to the most probable relative translation between both images. Before disparity mapping is carried out, salient features of the image, such as the bloodvessels, have to be extracted. The bloodvessels are segmented through series of traditional local operation, such as unsharp masking, thresholding, and median filtering. This process is illustrated in Fig. 6.16. Figure 6.16: Blood vessel extraction for registration and disparity mapping. above disparity mapping. 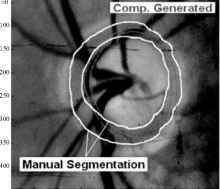 The manual segmentation from an ophthalmologist is also shown for reference. Figure 6.17(b) is the smoothed disparity maps from which the iso-disparity contours were obtained. 1. Pattern recognition techniques: This category includes multiscale approaches that extract large and fine vessels through low resolution and high resolution, respectively; skeleton-based approaches that extract blood vessel centerlines and connect them to form a vessel tree, which can be achieved through thresholding and morphological thinning; region-growing approaches that group nearby pixels that are sharing the same intensity characteristics assuming that adjacent pixels that have similar intensity values are likely to belong to the same objects; ridge-based approaches that map 2-D image into a 3-D surface, and then detect the ridges (local maximums) using various methods; differential geometry-based approaches; matching filter approaches; and morphological approaches. 2. Model-based methods: Model-based methods extract vessels by using explicit vessel models. Active contour (or snake)  finds vessel contours by using parametric curves that changes shapes when internal and external forces are applied. Level set theory  can also be adapted to vessel segmentation. Parametric models, template matching, and generalized cylinders model also fall into this category. 3. Tracking-based methods: Tracking-based approaches track a vessel from a starting point on a vessel, and detect vessel centerlines or boundaries by analyzing the pixels orthogonal to the tracking direction. 4. Artificial intelligence methods: These methods use the knowledge of targets to be segmented, for example, the properties of the image modality, the appearance of the blood vessels, anatomical knowledge, and other high-level knowledge as guidelines during the segmentation process. Low-level image processing techniques such as thresholding, simple morphological operations, and linking are employed depending on the guidelines. 5. Neural network-based methods: Neural networks are designed to learn the features of the vessels via training, in which a set of sample vessels containing various targeted features are fed into the network such that the network can be taught to recognize the object with these features. 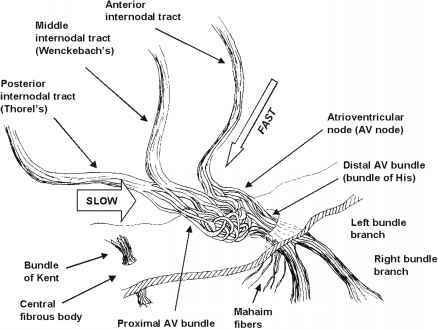 The capability of the trained network in recognizing vessels depends on how thorough the features are represented in the training set and how well the network is adjusted. 6. Tube-like object detection methods: This category represents other methods that extract tube-like objects and can be applied to vessel segmentation. Some of the above approaches have been applied to retinal blood vessel segmentation. Chaudhuri et al. used a tortuosity measurement technique and matching filter for blood vessel extraction and reported 91% of blood vessel segments and 95% of vessel network. Wood et al. 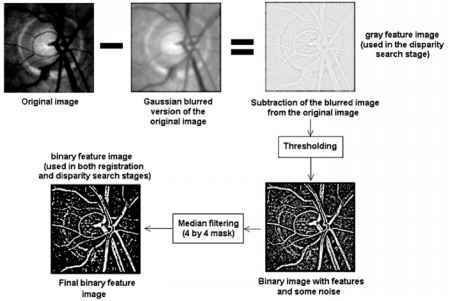 extracted blood vessels in the retinal image for registration by first equalizing the image with local averaging and subtraction, and then nonlinear morphological filtering was used to locate bloodvessel segments. Hoover et al. proposed an automated method to locate blood vessels in images of the ocular fundus. They used both local and global vessel features and studied the matched filter response using a probing technique. Zana and Klein  segmented vessels in retinal angiography images based on mathematical morphology and linear processing. FCM and tracking-based methods can also be used in retinal vessel segmentation . Zhou et al. proposed an algorithm that relies on a matched filtering approach coupled with a priori knowledge about retinal vessel properties to automatically detect the vessel boundaries, track the midline of the vessel, and extract useful parameters of clinical interest. We can see from the previous section that accurate blood vessel segmentation is very important for registration and disparity mapping. The segmentation method described previously involves Gaussian filtering, unsharp masking, thresholding, and median filtering all of which can be easily affected by image illumination or contrast of the image. Here, we used advanced clustering approaches for the same task and compared it with the Gaussian filtering method. Among the three color channels, the green channel provides better contrast for edge information. Therefore, it alone can be used to accelerate subsequent segmentation processes. Challenge of blood vessel segmentation lies in distinguishing the blood vessel edges. 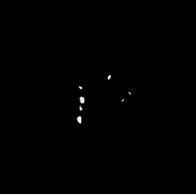 However, most images are noisy and nonuni-formly illuminated. In the optic disk area, blood vessel edges are smeared by reflectance. Simple segmentation techniques such as the one described above can produce noisy and inaccurate result. As is illustrated in Fig. 6.19(a), edges of the optic disk are mistakenly classified as bloodvessel edges. DA clustering solves this problem. Figure 6.18(c) shows the segmented result. Image resulted directly from DA segmentation is still affected by the noise in the original image, since single pixel intensity is used as feature. However, the noise in the segmented image can be easily removed through morphological filtering. The expansion or shrinking of blood vessel edges caused by morphological erosion and dilation can be corrected by edges detected by a simple edge detector, such as a Canny edge detector. Figure 6.18(d)-6.18(f) show the segmented optic disk, optic cup, and blood vessels in the ONH, respectively. The optic disk/cup segmentation is very similar to the manual segmentation in Fig. 6.18(b). Blood vessels thus segmented are then used for registration and disparity mapping in the 3-D optic disk/cup segmentation, as is shown in Fig. 6.19(b). Three-dimensional visualization of the optic disk/cup with and without DA segmentation is comparatively demonstrated in Figs. 6.19(c) and 6.19(d). We can see that with DA segmentation, more accuracy is achieved.